The Xbox 360 is the second video game console developed by and produced for Microsoft and the successor to the Xbox. The Xbox 360 features an online service (called Xbox Live), used to download games and game demos, music, and video media. The Xbox 360 was officially unveiled on MTV on May 12, 2005. Xbox 360 only supports FAT 32 formatted drives. PS3 is the short for PlayStation 3, which is a home video game console produced by Sony Computer Entertainment. It was first released on November 11, 2006, in Japan. It is the successor to the PlayStation 2, as part of the PlayStation series. Its main storage media is Blu-ray Disc, and it is capable to link with PlayStation Portable (PSP). SONY is using FAT32 as the standard for the PS3. From the information above we can see Xbox 360 and PS3 both support to FAT32 file system, so they can not read NTFS partition. How to deal with NTFS HDD cannot be read by Xbox 360 or PS3? As we all know that Xbox 360 or PS3 cannot read NTFS HDD partition, how to deal with it? FAT 32 file system is key point to this question. FAT 32 is the standard file system to Xbox 360 and PS3, and it is also the most common used drive format. To solve this problem, we need to convert NTFS to FAT 32 file system. We can convert between two of them by Disk Management or AOMEI NTFS to FAT 32 Converter 2.0. It is well known to us that NTFS and FAT 32 are two file systems for computer to manage the files on disk. FAT 32 breaks some limitation of FAT, besides the limitation with 2TB drive’s size at most. And it supports to files no more than 4GB, which means the single file over 4GB cannot be saved in FAT 32. Although it has this limitation, it is also can compatible with many machines, like MacOS, Windows, Linux, Play Station, XBOX, PS3, etc. FAT32 is a good choice for the users who are running multiple OS, while NTFS is the newer drive format which has great security, file by file compression, quotas and file encryption. 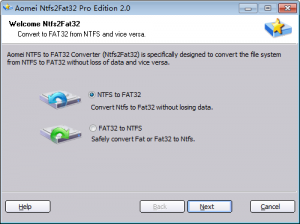 With Windows built in Disk Management, FAT32 can be converted to NTFS but it is not so easy to convert NTFS back to FAT32. First, it is not allowed to format the NTFS partition larger than 32GB as FAT32 file system, even the partition is empty. This is the inherent limitation in Windows. Second, format NTFS partition to FAT32 will cause everything erased including important data. AOMEI NTFS to FAT 32 Converter 2.0 is free and professional for converting file system between NTFS and FAT32 without data loss, without partition size limitation. 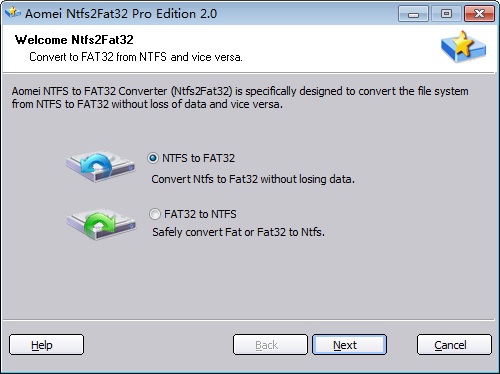 It supports to convert FAT, FAT32 to NTFS and convert NTFS back into FAT32. Nothing can prevent you from doing these operations. We all know that convert FAT32 to NTFS is easy to operate, but convert NTFS back into FAT32 is more difficult. At this situation, NTFS to FAT 32 Converter could be the best choice to solve this problem. You can download it to have a try.